I like a good horror story, and I clearly enjoy graphic novels, so I thought that this would be right up my alley, but … well … I’m still not entirely sure what to make of this. I’ve been thinking on it for a few days now. 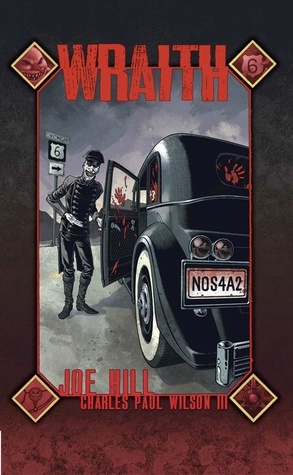 I know nothing about the background of author Joe Hill (I see that this is supposedly using characters from other stories?) but you really shouldn’t need to know anything about an author or a character when you begin a book…it should all be there for you. And it is. The book appears to be broken in to four unique stories that tie together, albeit a bit bleakly. My digital ARC was a little difficult to read because there was no clear division between the first and second stories and I had to thumb backward and forward a few times before I realized we’d moved on to a new story. The final story is told in a very different format and was easy to discern. The Wraith, which appears to be a bit of a magical vehicle with a ghastly driver, brings people, good and bad, to Christmasland…a horrific anti-holiday world where children with rows of massive sharp fangs rule. The first story, 26 pages, is nothing more than the driver bringing a scared child to Christmasland, and the child slowly becoming the demon who will inhabit (and rule) the horrific land. The second story, which was easily the more interesting, had a van of prisoners taking control of the guards and calling on the Wraith to bring them to safety. Instead they are brought to Christmasland where they all struggle for their lives and seek the impossible – escape. And the third story …? We’ll come back to that. What is first evident to me is that Joe Hill is not accustomed to writing graphic novels. There is a special skill set needed when writing something that is either illustrated or staged (in this case, illustrated). Understanding how the illustrations can work for the story-telling is important. But if it’s simply a story, that is put to illustration, the work can grow tedious and dull. This was the case for the first story. I saw no reason or need for the illustrations, except, perhaps, for the very final panel. And while I was not a fan of the artwork in general, the artist (Charles Paul Wilson III) was challenged to find interesting ways to fill 26 pages when the entire story takes place inside a car. Our second story is at least interesting, with a set of characters with differing personalities which allows us to follow different reactions and sub-stories. The art was fair at best. There were times I couldn’t tell the aged woman jailer from the skinny criminal, or the carny geek from the driver. When you can’t tell the players by looking at them, this is not a good sign! Our third story… this is another case where the writing is clearly not intended for a graphic novel and at least they didn’t try. Instead it is presented as a story, lavishly illustrated, rather than a sequential art in comic book panels. The story is written in second person which has always struck me as a cheap way to try to draw a reader in to the story (YOU are doing this and YOU are doing that, therefore YOU must be invested in the story). I have to admit I skimmed this portion somewhat…and despite the volume of books read, I do not typically skim my reading. I just dislike the second person narrative too much. If I am doing these things, then I would make different choices. The ‘payoff’ at the end is just what you would expect from the format… ‘you’ a taken to Christmasland where ‘you’ see your loved ones who were taken from you too early, but the reader ‘you’ knows that ‘you’ will be brutally killed after the final sentence. The concepts here are interesting enough that I’d like to give Joe Hill’s books a chance, but whether he wrote these specifically for the graphic novel format or the graphic novel company chose to adapt these, I don’t know, but it doesn’t work. Horror is difficult to pull off in comics. Grotesque and blood-splatter is easy. But horror, good horror, is more than just children with fangs and lots of blood. Looking for a good book? Devotees of blood-splatter comics might enjoy this graphic novel, The Wraith, but Joe Hill’s writing doesn’t work in this format.